A new awards program for 2019 celebrating innovation and excellence success stories both regionally and globally. As an association whose purpose is to improve the quality and integrity of trading relationships, we understand the importance of recognizing individuals and organizations who are achieving the highest standards in the field of contract and commercial management. Our new IACCM Innovation & Excellence Awards 2019 will celebrate success stories from around the world. There are five awards and we encourage individuals and organizations whether large or small, who believe they have a story to share, to enter. Submissions can be made either at a regional level or if your entry is truly international in nature, you may prefer to submit directly to the global program. You can submit your entry to one of our regional programs: EMEA, Asia Pacific or Americas. 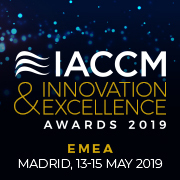 The finalists of each regional heat will be invited to a prestigious awards ceremony at our IACCM annual conferences. The winners of each category at a regional level will automatically be put forward to the Global Awards Program and the finalists will be notified and invited to attend the Global Awards Ceremony which will be held in 2019 in Phoenix, Arizona. There are five awards and we encourage individuals and organizations, large and small who believe they have a story to share, to enter their regional heat. If your entry is truly international in nature, you may prefer to enter our international heat. For an individual practitioner who has shown outstanding leadership or endeavor in delivering value and raising the profile of contract and commercial management and in managing contracts fairly and openly. We are looking for professionals across the globe who can demonstrate success in creating an atmosphere of openness, cooperation, trust, honesty, commitment and mutual understanding among team members and between contracting parties. You can nominate yourself, someone on your team or an individual from one of your customer or supplier relationships. Initiatives that have delivered significant business value through an improved commercial or contracting process or practices. Initiatives that have raised the strategic profile and contribution of the commercial or contracting process or function. For consultants, service or application providers who have led or enabled high-value initiatives at client organizations. Initiatives that deliver meaningful change and significant impact, fulfilling the vision of IACCM. Congratulations to our EMEA finalists who will be joining us for the awards ceremony at our Europe Conference in Madrid from 13-15 May! If you are based in Asia Pacific, please find out more here. You might be celebrating your success as a finalist with us at the IACCM Asia Pacific Conference in Sydney from 24-26 July! Deadline for entries is 24 May 2019. If you are based in Americas, please find out more here. You might be celebrating your success as a finalist with us at the IACCM Americas Conference in Phoenix from 4-6 November! Deadline for entries is 6 September 2019. If your project has had an international impact or your organization has a global presence, you may prefer to enter our International heat instead of a Regional heat. Please submit your entries here. Deadline for entries is 6 September 2019.